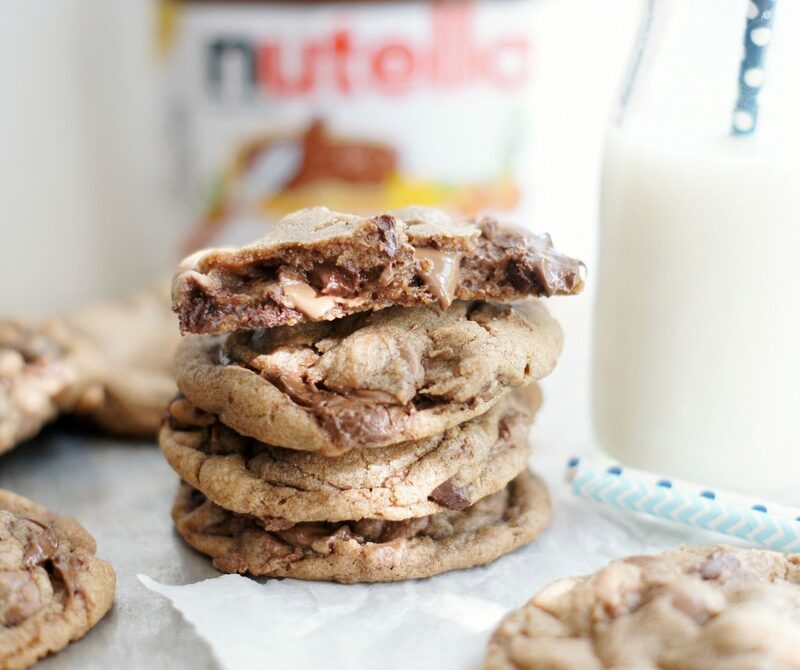 These Chocolate Chip Toffee Nutella Cookies will completely knock your socks off! 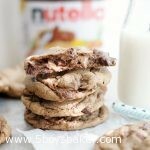 A chocolate chip cookie stuffed with chocolate chips, Skor candy bar, and Nutella. Sometimes when I’m getting my posts ready I’ll open up YouTube and watch/listen to music videos, mostly songs from the 80’s because let’s be honest, 80’s music is the bomb! Anyway, while I was getting this post ready I was watching/listening to Chicago and I have to admit I was feeling a little nostalgic and kind of missing my old high school days. . . is that crazy or what? Chicago does that to me every time.When my friends and I would be at a school or church dance Chicago was one of our favorite bands to dance slow dances to. Ohhhh the good old days! My love of the band Chicago is a lot like my love of cookies. It’s been going on for a really, really long time! I still love Chicago and I still love cookies (just in case you couldn’t tell)! 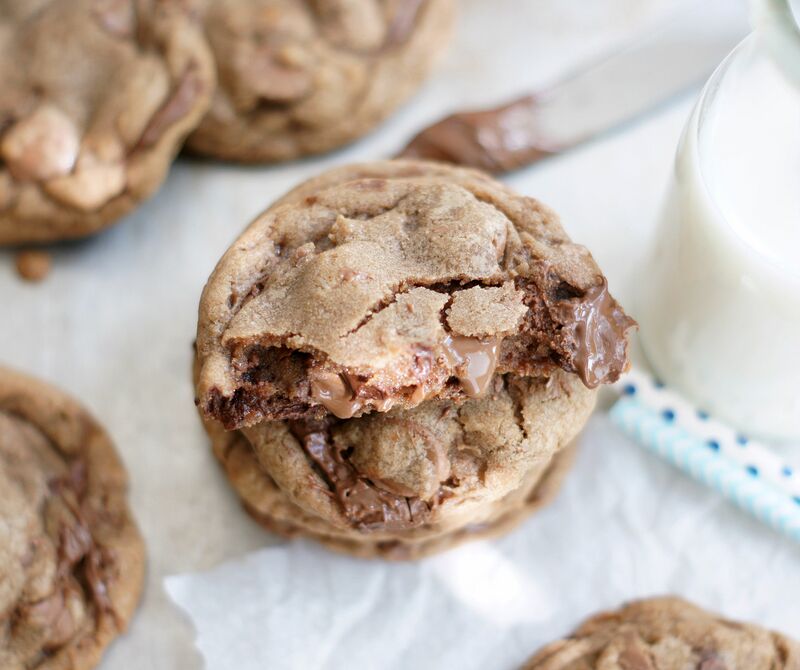 These Chocolate Chip Toffee Nutella cookies happened in my kitchen the other day. Oh these cookies! They left us all speechless. 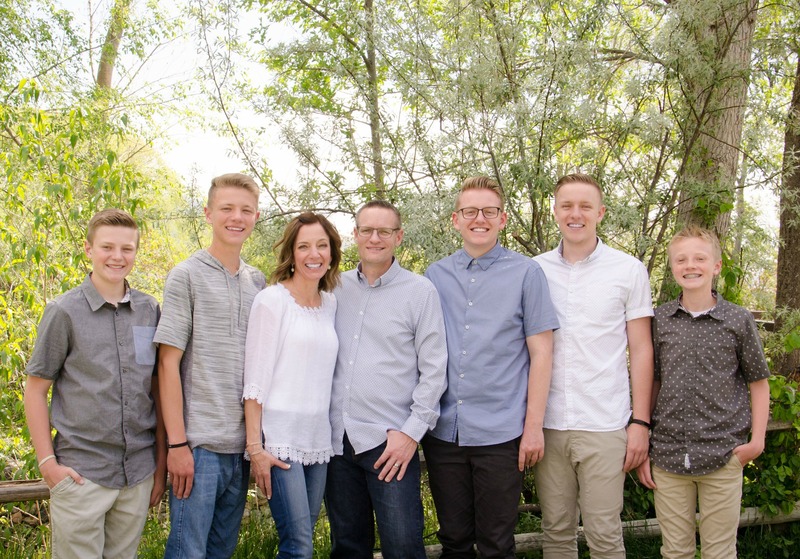 Let me just say they are the bomb (just like 80’s music)! 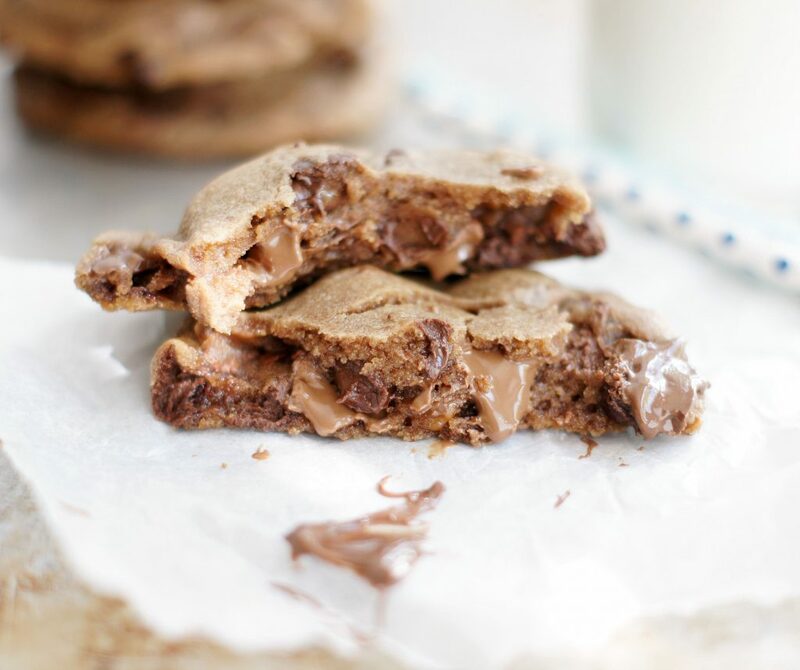 A chocolate chip cookie dough full of chocolate chips, Skor toffee bar and Nutella with a little extra Nutella sandwiched between two balls of dough. Pretty dang fabulous if you ask me! Now if only I had some left so I could eat one while I listen to a little Chicago Ü. These cookies are A M A Z I N G!!!!!!!!!!!!!!!! Oops, sorry. Fixed! It’s 1 1/2 cups. Hi Barb, I’m sorry I can’t remember exactly how many it makes (especially because it’s been awhile since I’ve made them), but if I remember right, depending on the size you make them it should yield 18 to 24 cookies.